Catalan president Carles Puigdemont asked for it and the pro-independence majority in the Catalan Parliament has replied. Junts pel Sí (Together for Yes) and CUP (Popular Unity Candidacy) have asked for the holding of a special session, to take place this Thursday morning, “to analyse the institutional attack implied by the application of [article] 155 [of the Spanish Constitution”. They also sent a request to the Institutional Affairs Commission, for the senators nominated by Catalonia who will be in the Senate meeting this Friday to vote on article 155, to appear there this Tuesday. They will also today ask the Parliament’s Board to present legal actions, “administrative but also penal” against the Spanish cabinet’s agreement on article 155, which “could have incurred crimes”. The offer of dialogue and mediation as a conflict resolution tool. Evaluation and effects of the application, if it happens, of article 155 of the Spanish Constitution. 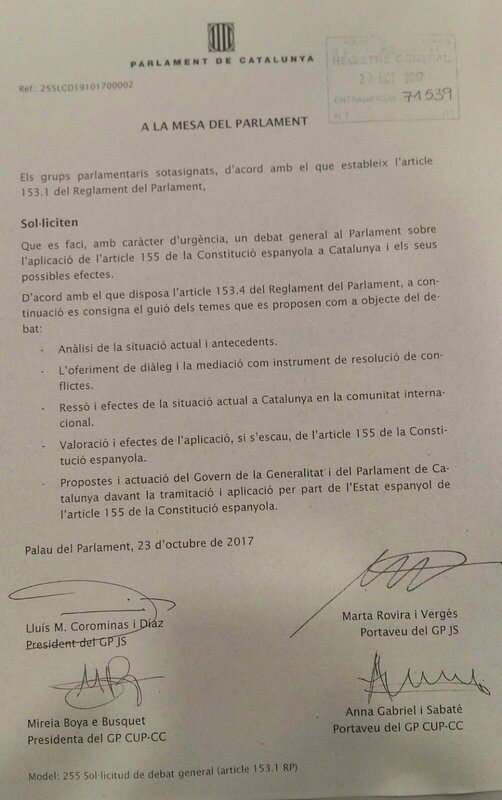 Proposals and actions of the Catalan government and the Parliament of Catalonia in the face of the processing and application by the Spanish state of article 155 of the Spanish Constitution. The president of the parliamentary group of Junts pel Sí, Lluís Corominas, didn’t want to give more details about the specifics of the session, nor whether any declaration or resolution will be put to a vote. He did, however, note that president Carles Puigdemont said that it would be the Parliament that determines the response. “It should be the Parliament, where sovereignty lies, which decides what the response should be, and if it has to include a resolution,” said Corominas. Corominas accused the application of article 155 of being a “case of institutional violence” and the Spanish government of only looking for confrontation. “Juridically they’re ignoring their Constitution, which couldn’t be overstepped,” he said. He also warned that, if Spain goes ahead with intervening in self-governance, “they will make the conflict bigger”. The president of Junts pel Sí attacked the “far-right position” of the PP (Popular Party), Ciudadanos (Citizens) for being “anti-Catalan” and PSOE (Spanish Socialist Workers’ Party) for collaborating with them. He then addressed PSC, the Catalan branch of PSOE, saying that they “will have to choose between PSOE and defending the Catalan institutions, between party and country“. The Parliament’s rules establish that the debate can be started with a speech by a representative of the groups making the proposal, with a maximum time limit of half an hour to explain the reasons for their request. Then, with no time limit, the president Carles Puigdemont will speak and, as the case may be, the members of the government he nominates. After these speeches, the session can be briefly suspended. When it restarts, it’s the turn of the representatives of each parliamentary group, with thirty minutes each. If the president or government responds, they will have ten minutes to do so. If Puigdemont or the executive then speak again, a last turn for the groups will open, five minutes each. Once the debate has finished, the groups will be able to propose resolutions, which can then be transacted. The Board of Spokespeople has agreed that each group can present three proposals. Once the session restarts, it will debate and vote on the proposals. They can be passed by simple majority, that is more votes in favour than against. 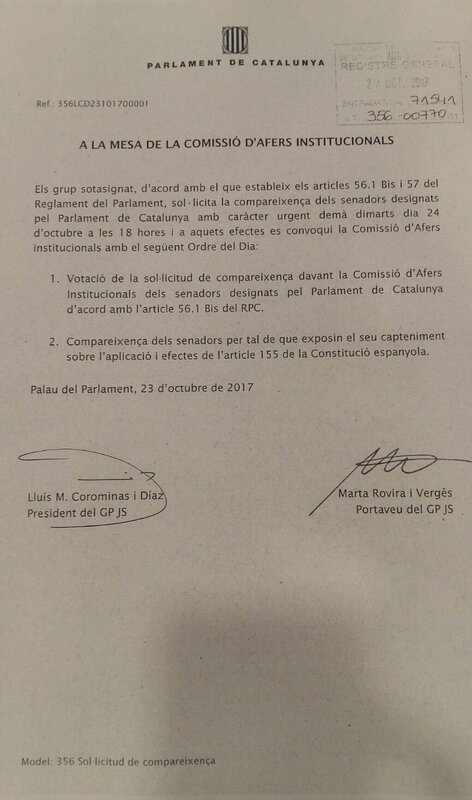 The two pro-independence also presented another note, addressed to the Institutional Affairs Commission of the Parliament, asking it to hold a session this Tuesday starting at 6pm to be attended by all the senators nominated by the Parliament that will take part in the Senate debate and vote this Friday on the measures proposed by the Spanish government through article 155. This will include former Catalan president José Montilla and the president of the Catalan branch of the PP, Xavier García Albiol. Finally, Junts pel Sí and CUP will today send a note to the Parliament’s Board asking them to “present all those legal actions” against Saturday’s agreement by the Spanish cabinet over article 155, the aim being to “defend the Catalan institutions“, particularly the Parliament. These actions are to be “administrative but also penal”, because they believe that the Spanish government might have “committed crimes” and ignored the Spanish Constitution and the Statute of Autonomy of Catalonia. Corominas called for the Catalan institutions to be defended peacefully and democratically. These institutions, he said, “aren’t property of the Bourbon monarch [Felipe VI], nor of prime minister Rajoy”.